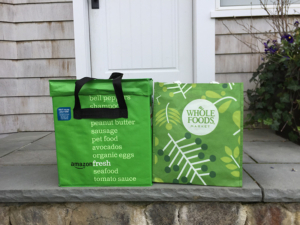 Does Amazon-Whole Foods make Grocery Store Efficiency more relevant? Friday’s news hit Bloomberg at 9:06am. Within minutes my 14 year-old daughter walked in with,”Hey Dad, did you hear Amazon bought Whole Foods for $13.7 billion?” There’s no Bloomberg terminal in her room, just an iPhone feed. Rarely does a merger get this speedy visibility with both consumers and stock market followers. Hours later, WalMart’s Bonobos acquisition announcement was a yawner compared to their last summer’s $3 billion acquisition of on-line retailer Jet.com, a big move into Amazon’s space. With AMZN-WFN, investors immediately started speculating on the future of US retail, while the rest of retail is getting hammered with more store closings this year than the prior 20 years. But the deal wasn’t about retail – it was about retail grocery. That night at dinner my family wondered if we’d see drones taking off from the local Whole Foods, delivering green Amazon Fresh packages to our house. The Groom Energy team was more interested to consider that this may increase attention by grocery operators on reducing operating costs through green investments. Whole Foods has always been a leader here, both in upgrading stores for energy efficiency and on-site renewables. Grocery has higher energy costs per square foot than retail, and the reason is simple. Refrigeration. Refrigeration costs more than HVAC and lighting. At night BestBuy can dim their lights and set back HVAC temperatures. Turning down refrigeration melts the ice cream. So while grocery costs more to operate, there’s a relatively bigger opportunity to save energy. Unlike retail, the total number of grocery stores has been increasing each year since 2011. Our experience tells us most grocery stores consume between 1 and 3 million kilowatt hours per year, and, on average, their consumption can be reduced by 25% through technology upgrades in lighting, refrigeration and HVAC. So with 37,000 US stores, that’s a $1.5 to 2.5 billion energy savings opportunity. The future of grocery refrigeration is also being affected by environmental regulations. Traditional refrigerants are being phased out and the upgrade process to newer chemicals will be multi-year and expensive. The most forward-thinking players are already live with their first new systems based on C02 or propane. At last week’s ATMO America show, Paul Anderson from Target said that by the end of 2017 they would have installed 13 stores with C02 systems and 580 with propane systems. Yet while CO2 and propane system adoption will accelerate, there remains a very large installed based of existing, older HCFC based systems. These systems run 24x7x365 so the ice cream doesn’t melt, but their demand varies based on weather, customer foot traffic, temperatures of restocked product and normal wear and tear. Depending on the system’s condition, we may upgrade the compressors or install floating head-pressure controls that reduce the refrigeration load when ambient temperatures and humidity are low. We also gain energy savings through our regular retro-commissionings (tune ups) that get the systems to their optimal state. The challenge is that periodic repairs and temporary workarounds often override the work we’ve just completed. By adding additional sensors and cloud-based access we can couple our upgrades, maintenance and performance tuning into one managed services approach. This integration of services into one offering can brings grocery operators intelligent refrigeration management, and we’re convinced it’s the next big thing in store efficiency. So while the world saw AMZN-WFN and thought food and retail, we thought refrigeration and energy. Hopefully if the merger closes it will serve to accelerate both markets to a next stage of efficiency.